The Delorme Earthmate PN-60w updates the PN-40 with improved battery life, expanded internal memory, activities (similar to Garmin’s profiles) and the ability to link wirelessly to other PN-60w’s and the SPOT Satellite Communicator. Power management is one of the biggest improvements, as short battery life was a common complaint about the PN-40. UPDATE: DeLorme has discontinued the SPOT Satellite Communicator in favor of their own product, the DeLorme inReach, which offers two-way communication and works as a standalone device or can connect with the PN-60w or with the iPhone or Android smartphones. Call me crazy, but I love all day mountain bike rides where I go so far back that I’m unlikely to see another human; the more isolated and rugged, the better. I prefer to do these with my biking partner (the most wonderful wife in the world), but all too often I’m out there solo. What’s a crash-prone, wilderness-seeking, aging mountain biker to do? 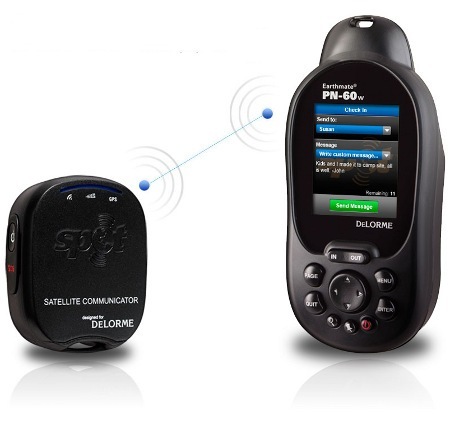 Get the Delorme Earthmate PN-60 with SPOT Satellite Communicator , that’s what. This combo (the two separate units are shown above) is the first consumer product to combine a GPS receiver with the ability to compose a custom message in the field and send it via satellite. UPDATE: I have reason to believe that this deal may be gone by tomorrow. I suspect that DeLorme may have saddled dealers with a minimum resale price, though that is purely conjecture on my part. UPDATE 2: Hmm, the deal is still there as of 9/22. Maybe I got bad info. The page now says the rebate is in effect through 9/25. UPDATE 3: Looks like its now priced at $449.00. J&R Computer/Music World has the DeLorme Earthmate PN-60W Handheld GPS with SPOT Satellite Communicator on sale for $399.95 with free shipping, $90 less than Amazon’s price this morning. This is an amazing deal for a just released product that allows you to text friends, send an SOS, or post to Twitter or Facebook where there is no cell reception. The SPOT Satellite Messenger is getting some new competition from personal locator beacons (PLBs). These emergency devices utilize the Cospas-Sarsat satellite system designed to aid in search and rescue missions. The advantage SPOT has enjoyed, is the ability to send non-distress signals. Today, Cobham Life Support-ACR Products announced a new service that will take advantage of PLB’s self-test function to send non-distress messages via text and email. While PLBs are more expensive than the SPOT Satellite Messenger, this newly-leveraged functionality will be priced at $39.95 to $59.95 per year, significantly lower than SPOT’s $99.99 basic plan. Another differentiating factor is that the PLB can continue to be used for emergency extraction, even if the subscription plan expires. These advantages may help drive sales volume, allowing further reductions in unit costs. UPDATE: I’ve posted reviews of the DeLorme Earthmate PN-60w and the PN-60w / SPOT Communicator combo. UPDATE 2: DeLorme has discontinued the SPOT Satellite Communicator in favor of their own product, the DeLorme inReach, which offers two-way communication and works as a standalone device or can connect with the PN-60w or with the iPhone or Android smartphones. We’ve got some big news for backcountry types today. DeLorme and Spot have jointly unveiled the first combination ruggedized GPS navigator and satellite communicator. The DeLorme Earthmate PN-60w with SPOT Satellite Communicator can send customized text messages to individuals or groups. While emergency messaging or personal locator beacon capability is something I’ve been wanting to see in a handheld GPS receiver for awhile, plans are for the PN-60w to offer even more.